That was pretty cool! I saw a link about this earlier today, but I didn't realize they were in a new Mustang, so I just ignored it. I'm glad I ended up watching it. Beautiful car. The girl... aight. About as genuine and real as all the Ducati Scrambler videos, but, lots of tire smoke. What I noticed once again is that the new Mustang sure is quiet. Too quiet if you ask me. And, the entire car may have become too civilized. 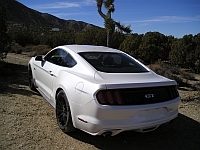 It appears that the GT350 may get it right, but, I am $60K short of picking one of those up. So, I have ruled out a new Mustang and a Ducati Scrambler which leaves me with nothing to lust for as far as vehicles go. I used to always find some new vehicle to lust over and seriously consider purchasing at least once every model year, that was affordable by me (even if I had to get quite creative to raise the money), but these days I seem to have lost my fire. But, perhaps I have just been squeezed out of the game due to sharply rising prices since, in the case of the new Mustang and the Ducati Scrambler, there is zero availability, so, some have the funds to buy in. SonicVenum wrote: That was pretty cool! I saw a link about this earlier today, but I didn't realize they were in a new Mustang, so I just ignored it. I'm glad I ended up watching it. Beautiful car. The girl... aight. Have you forgotten about 1 vid where your favorite rider showed that it could actually be ridden with gusto? Or was that one not genuine because they put a real rider on the bike for once? That was the vid that moved me to slap down a deposit and get the bike in 2015 instead of analyzing endlessly and waiting for the next spin cycle which could be 2016. There are rumors of a 500cc version (a single) and some strange ones about a 1200cc version -- which makes no sense to me. The aftermarket has not really kicked into gear yet, but I suspect that there will be stuff to play with later this year. I saw a vid where a guy cranked up the bike in a cold environment, and it sounded cold, and just drove off revving it too much for my taste. The engine sounded like a harvesting maching... Someone commented on the vid about the engine sounding good. ??? I didn't bother to post that vid. Oh yes, with the money laundering considerations in Mexico, I had to email pictures of my passport and a current utility bill showing my home address to the Ducati dealer today.